How Effective is Your 401k? When most people think of pension plans, they usually think of 401k plans. Many 401k plans have opted to become so-called 404(c) plans. The significance in the 404(c) designation is that it allows pension plan sponsors to shift the risk of investment losses to plan participants. In 404(c) plans, the plan sponsor selects the investment options available for the plan, leaving the choice of which of the investment options to each plan participant. While there is general acceptance that many participants in retirement plans are not knowledgeable enough to choose and manage their investment options, ERISA does not require that a plan provide investment education classes for 401k or 404(c) plan participants. Worse, even when education classes are provided, they are essentially worthless. In many cases, the classes consist of little more than a series of pie charts depicting model portfolio allocations. 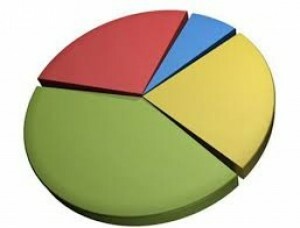 Pretty multicolored pie charts. Lee Munson, author of “Rigged Money: Beating Wall Street at Its Own Game,” appropriately refers to the use of asset allocation pie charts as the “lie of the pie.” Investors relying on such charts often expose themselves to unnecessary risk exposure and financial loss. Asset allocation pie charts often recommend allocations to various asset categories, e.g., large cap growth, small cap value funds, international funds, and pass such allocations off as portfolio diversification. Proper diversification helps to provide investors with downside protection against significant losses. The problem with such cookie cutter allocations is that they often fail to factor in the correlation of returns between such investments. Both the Department of Labor and ERISA have adopted modern portfolio theory (MPT) as the standard of evaluating prudence in investment decisions. The cornerstone of MPT is factoring in the correlation of returns between investments to reduce the risk of significant losses, one of ERISA’s goals. And yet, neither ERISA not the DOL require that plan participants be provided with such information, despite ERISA’s “sufficient information” requirement. So, an investor may falsely believe that they have downside protection by virtue of holding four types of investments, while in truth they have a portfolio providing little downside protection due to the high correlation of returns among their three equity-based investments. Retirement plan participants who suffered through the 2000-20002 and 2008 bear markets can tell you about the consequences of such false diversification. Both the DOL and ERISA openly admit to the significance of such information. Such information clearly furthers the announced purpose and goals of both ERISA and the DOL – (1) protection of employees, (2) prevention of significant investment losses, and (3) the provision of sufficient information to plan participants to allow them to make informed investment decisions. There simply is no justification for not providing pension plan participants with such vital information.